Let's say you are leaving your house for a morning ride... Is it cold? Will it be hot later? Do you need extra clothes? Will you get hungry along the way? 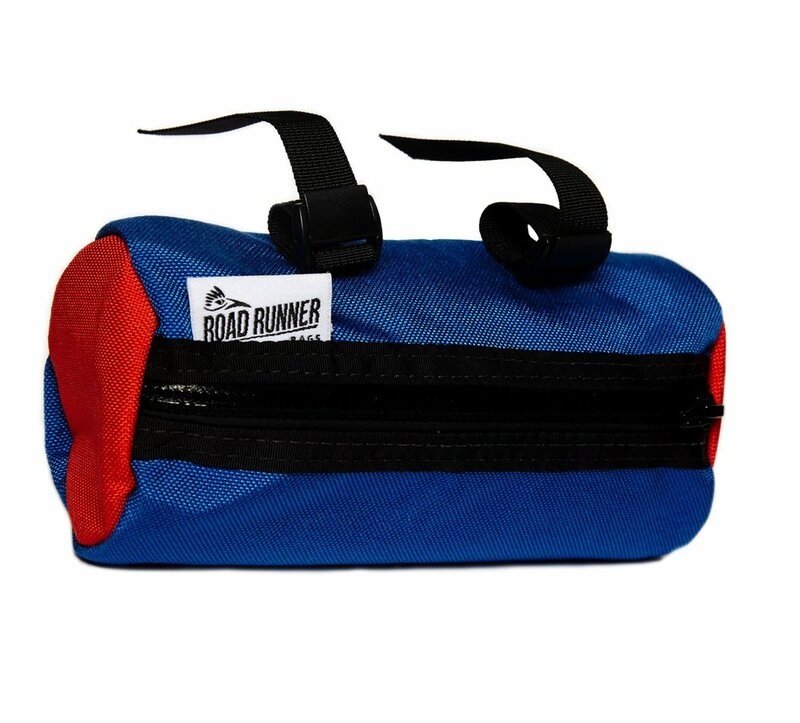 Never find yourself unprepared with this perfect little stash bag! The Burrito Handlebar Bag will keep your keys, wallet, phone, snacks, and spare clothes safe and dry. Equal to a California Burrito, this bag measures 8″ long and 3″ wide. This bag is double the size of our Burrito Bag and comes with a rear stability strap, hard plastic liner, and removable mounting straps for handle bars of all shapes and sizes. This bag includes a Nylon Webbing Mollee system on the front for strapping just about anything to your bag! A unique high volume, rackless, universal handlebar/saddle bag. This bag is perfect for city commuting/road touring/dirt bike packing or casual beach rides - load it up with the essentials and have plenty of room for more gear. This bag was designed for cyclists by cyclists! It is easy use, fun to ride with and a treat when you need it; forget your bike is loaded down with the help of the Jammer! Lightweight, durable and water resistant! When fully expanded the Jammer will reach up to 9.75L in volume and can be rolled down to more than half of that. When fully expanded the Jumbo Jammer will reach up to 29 L in volume and can be rolled down to more than half of that. Yeah, 29 liters! You'll believe it when you see it. This bag was designed with the casual cyclist in mind but one that is also willing (and desiring) to get a little rowdy now and then. Don't let your gear keep you from exploring local single-track. Let’s get those tools and tubes out of your pockets and onto your bike. This saddle bag is the perfect size for: 1 Tube, 1 CO2 Charger 1 patch kit, 2 tire levers, and 1 multi tool. Just the necessities! We always want you to be seen and have a place to clip your rear light, with that we installed a reflective strip that doubles as a light loop.